Since 2012, the NYC startup Audicus has worked to make getting high-quality hearing aids easy, accessible, and affordable. By partnering with leading manufacturers and taking the process online, the startup offers hearings aids for thousands less by eliminating doctor office markups. 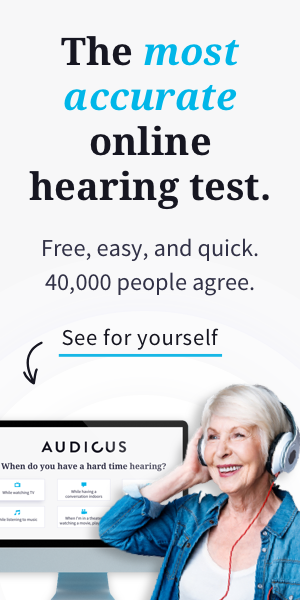 In August 2017, Audicus debuted their Online Hearing Test, the first to produce results so accurate, they could be used to program custom hearing aids. Now, Audicus continues to lead innovations within the hearing industry with a new site, hearing aid, payment plans, and subscriptions. Transforming lives, 1 ear at a time. The answer was creating a site that refused to box their demographic in with stale imagery and narrow depictions of the 50+ demographic. Audicus Director of Product, Youmna Aoukar explained that they “wanted to inspire people to treat hearing loss by showing real customers following their passions and by fighting stigmas with an empowering new look and feel.” By creating a more positive experience for people to learn about and treat their hearing loss, Audicus aims to encourage people to take action. Meet the Audicus Clara receiver-in-canal hearing aid. Audicus also debuted a new hearing aid model, the award-winning Audicus Clara. The receiver-in-canal (RIC) model features auto-adapt technology for seamless sound experience and speech focus that filters out background noise, all at the size of an almond. The Clara covers mild to severe hearing loss and can be customized with special program settings, enhanced clarity, Bluetooth, or rechargeability options. Audicus has always sold hearing aids for thousands less than the same quality devices sold at the audiologist or doctor’s office. But the company wanted to do more to make hearing affordable to everyone. The Audicus Clara starts at only $699, but with a new zero APR pay over time option, customers can select 8, 12, or 24-month plans, bringing the cost of a hearing aid down to less than a tank of gas. Customers are qualified through Affirm in a seamless checkout process. Monthly payments start at $39 per ear. The company also announced 2 new subscription options to help customers care for and protect their hearing aids. The new Audicus Care subscription sends quarterly supply kits to customers with everything needed to use and care for their hearing aids. Kits are customized to each person’s fit and model and include batteries, replacement earwax guards, domes, and cleaning tools. Any existing customer can subscribe for $18 per month. New Audicus customers can now subscribe to an extended, worry-free warranty. The Audicus Protect subscription covers expert Clean and Care services every 6 months, 1-time loss protection, and 1-time damage protection. The subscription starts at $19 per month, per ear. With a new site designed to streamline hearing healthcare, customers can now order a customer hearing aid from in less than 30 minutes. The Online Hearing Test, unlimited access to hearing experts, and new accessories page create a more seamless online end-to-end solution. Anyone can speak with an expert at any time by phone, chat, or email and users can get additional information at the new Audicus support center. Explore the new Audicus website.